I was going to Japan for a month, and I set the tentative goal of learning at least the katakana script used to represent the Japanese language. My plan worked. After 10 days I could at least pronounce things written in katakana, and within another 3 days, hiragana. I didn't pronounce them exactly right, and I certainly wasn't reading. I only recognized Japanese words I already knew, like edamame or yakitori, or approximate cognates like superu hoteru. There's a lot of English signage in Japan, I really didn't need to know katakana or hiragana. But it came in handy a few times. The kana scripts for writing Japanese syllables: katakana at left, hiragana at right. This page is really about my experiments and experiences in learning something unexpected and quite foreign on my own. It isn't specific to Japanese scripts. I have some tips that relate far more to preparing for a certification exam than to most people's idea of traveling to Japan. How hard can this be? The kana scripts are monoalphabetic substitution ciphers on a syllabary. They're really encodings rather than ciphers. Well, it's weak in terms of cryptographic theory but the orthography is a chore. The scripts are two sets of modified Chinese glyphs organized in a Sanskrit order, with no hints at their Japanese pronunciation even if you knew the underlying Chinese or Sanskrit. The Japanese writing system is absurdly complicated. The complexity starts with how it's really three systems, plus a fourth used to render foreign words literally and to represent Japanese so that people who don't know the language can pronounce words, at least approximately. Kanji is the first part. These are adopted Chinese logograms, symbols that mean one word or short phrase each. Most kanji symbols are rather complex, a lot of visual detail for just one or two syllables, and there are well over 50,000 of them. They have the same meaning that they do in Chinese languages. So, if you can read Mandarin, Cantonese, or another Chinese language you can read the kanji components of Japanese. However, the pronunciation of most kanji is completely different in Japanese. For example, 枝豆 means "stem peas", pronounced eda-mame in Japanese. Yes, the soybean snack. 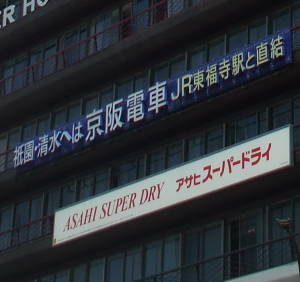 The name of Japan's capital city is 東京, meaning "east capital" and pronounced to-kyo in Japanese. Japanese primary and secondary school students are required to learn a basic set of 2,136 kanji symbols. They learn 1,006 kanji in primary school and 1,130 more in secondary school. That's 80 in 1st grade, 160 in 2nd grade, 200 in 3rd grade, 200 in 4th grade, 185 in 5th grade, and 181 in 6th grade, and then the next 1,130 through high school. Any visitor to Japan could use the two kanji you see on toilet flush handles: 大 for large and 小 for small. Japanese grammar is entirely different from Chinese grammar. Japanese needs a way to indicate verb tense, inflection to indicate case of nouns and adjectives, and components for the tasks played by small words like "to", "from", "by", "for" and so on in English. Also, Japanese needs a way to represent words for which there aren't kanji. Japanese has two such systems, used in different circumstances. Hiragana is used for Japanese words plus grammatical elements needed to indicate tense, case, and so on. It is also used to explain more obscure kanji that many readers won't know. That's right, some things are written in one preferred system, and then explained in a completely different one because the preferred one is overly complicated or difficult. On an advanced level, an author might choose between writing a word in kanji to be more formal, versus spelling it out in hiragana to be less formal or more emotional. Katakana is used to spell foreign words and names; the names of animals, plants, and minerals; technical and scientific words; and many company and product names. Ramen, a specific type of soup noodles, comes from China, so it is spelled out in katakana as ラーメン. Katakana is also used for emphasis, as English speakers might use Italic font. In addition to those three systems, romanji is the use of the Latin alphabet to phonetically spell Japanese words for readers of Latin-alphabet languages. For example, yakitori, edamame, sake, and so on. A diacritical mark indicates which vowels are longer, as in Tōkyō and Kyōto. Japan isn't the Japanese name for the country. The country's name is two kanji meaning "sun origin", relating to the myth of the Emperor being descended from a sun god. The kanji for "sun" is pronounced ni but the kanji for "origin" can be pronounced either hon or pon (and more about h-p variation below). So it's written in romanji as Nippon or Nihon. Romanji is used within Japanese text for Latin-alphabet acronyms like "a.m.", "p.m.", "CD", "DVD", and so on. Japanese is usually written with no spaces between words, and the text wraps without concern for word boundaries. Traditionally, it's written in columns, reading down columns from right to left. The modern method is horizontal, reading left to right across rows and moving down the page, as with European languages. "One hesitates for an epithet to describe a system of writing which is so complex that it needs the aid of another system to explain it. There is no doubt that it provides for some a fascinating field of study, but as a practical instrument it is surely without inferiors." Japanese syllables can be a bare vowel, a, e, i, o, u and the soft variants ya, yo, yu. Or, a consonant-vowel pair. Either of these can have a final -n. So, names like su-zu-ki, ya-ma-ha, yo-ko-ha-ma, to-kyo, and ni-hon. Buddhism spread from India, to China, and then to Japan. The priests who brought Buddhism to Japan had studied in China, reading scripture and commentary originally composed in Sanskrit and then written in kanji in China. The result is that hiragana and katakana are simplified versions of Chinese glyphs, organized for study or tabulating lists in an order based on Sanskrit. The usual presentation is a table with the consonants on one axis and the vowels on the other, ordered a-i-u-e-o. I quickly concluded that this vowel order was going to make things much harder for me. This is more than difficult enough already! MRW like, let's say, those three New York City Subway lines. Break things into chunks and use whatever mnemonics work for you. Those are lessons coming in more kana-specific ways below. No one is scoring me for style. So if I break the formal rules but still learn the content, that's fine. I'll disregard part of gojūon, the Sanskrit-influenced ordering. The consonant order didn't seem to make it any harder, at least not for me. What about beginning consonants G, Z, and D? Those are the voiced versions of K, S, and T, and the good news is that we don't have to memorize another 15 specific symbols for them. A special mark added to ka indicates that it is really ga, and so on. We just have to memorize that one mark instead of another 15 symbols. Here's the expanded table, again with unexpected pronunciations highlighted. Finally, you combine the *I form with the "soft" Y* vowel for syllables and words like Kyō-to, Tō-kyō, and Ryu-kyu. And the macrons or over-bars, like Tone Lōc? Those indicate extended length. ゜ is used only to change ha to pa and so on, just for the h* syllables. 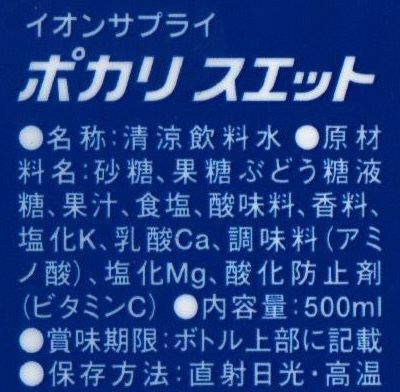 ゛ changes to voiced, so ka becomes ga, sa becomes za, and ta becomes da, plus ha becomes ba. And similarly for the other vowels. ki + ya becomes kya and so on. A dash, really the special ー kana, makes the preceding vowel longer. Memorize only what I really need to memorize. Those 46 syllables plus 4 rules give me the equivalent of the 107-syllable table. Looking at the Unicode charts and the Wikipedia pages for Katakana and Hiragana, I concluded that katakana was simpler overall. It's more geometric while hiragana is like cursive writing. I find cursive much more difficult to read in English. 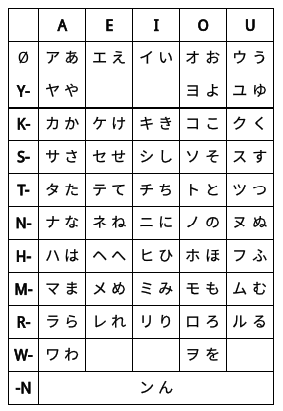 Compare katakana ro ロ or ni ニ to hiragana a あ or ne ね. So, let's start with katakana. Let's see, upper left corner, "a" is ア. OK, that's not too bad. A high horizontal line with a small hook, and a curving thing down out of the middle. What's next? "E" is エ. Hey, that looks like a capital "I"! Just the second letter into the table and I'm ready to throw down the material. Keep going, don't give up near the very beginning. and so on for s* and t*. Yikes. Where do I start? Don't give up. Start somewhere. Find some small starting point, whatever works for you. Then work your way out from that small foothold. Look at ツ or tsu. It is the "smart-aleck glyph" you see on Twitter: overbar-backslash-underbar-open-parenthesis-smirk-close-parenthesis-underbar-slash-overbar or ¯\_(ツ)_/¯. There are similar "arc and tick" characters シ, ソ, リ, and ン. Plus, there are more that include the arc, the lower right quadrant of a circle: ア, ウ, ケ, ク, ス, タ, ッ, ノ フ, ワ, and ヲ. But let's not try to learn 16 signs all at once! Instead I said split that into four smaller groups. "The Magical Number Seven, Plus or Minus Two" is one of the most highly cited papers in psychology. An average adult human can deal with about 7 things at a time, at most. Anyone might argue with the specific details, but its general theme is important: We should break things into groups of 5 to 7. I thought that many fell into similar pairs or larger related sets. I picked a representative "anchor" for each set and learned where it went. Then I started filling in the rest of each sets. ツ was the only katakana I was certain that I would recognize, so it was an obvious anchor. It plus the similar others. Ask a non-Windows computer programmer or system administrator for a name for a dummy variable or temporary file, and you'll probably get "foo", a meme from UNIX history. The fu glyph フ is a foundation for the members of this set. ニ is drawn and pronounced like the Chinese number 2, ni. It can be the anchor, the others are only similar to the numerals 2 and 3. I didn't recognize ロ as a Japanese character that I had seen somewhere, but a square certainly is distinctive. These are the most complicated katakana glyphs. Two versions differing by where they connect. ニ is the only one that really is a Chinese numeral. キ is approximately ニ crossed by a vertical line. The lines of the Chinese numeral for 3 are horizontal, not slanted like ミ. Someone saw me practicing writing these into a grid, and corrected me how I was drawing ミ as three horizontal lines. "That's a Chinese 3, not Japanese mi. The lines of mi slant down a little." I explained that I had no plan to write any Japanese, I just wanted to be able to pronounce katakana and hiragana. As long as I learned to recognize the signs, what would it matter if I thought that many street signs and labels slanted their mi for no good reason. "Hmmm. OK", he said. Don't worry about violating the rules. You get no bonus points for caring about Japanese penmanship or orthographic history. I made a master copy of my grid with the customized column order. Then at every meal I made at least 3 copies. The first thing to learn was the order of the consonants, the rows of the table. Then where to put the first ones I learned, e tsu ro fu, or エ ツ ロ フ. The annoyance of e looking like capital I actually made it easy to remember that one. After those four I would have to refer to the master the first few times I did this. Sometimes I just filled them in left to right across rows, going down the table. Other times I did them by sets. Other times by columns (vowels). However, I soon saw that columns are too large. Once I started picking up a few of them, I started trying to find ones that I knew in signs and labels. Then trying to figure out what the others were. This was sort of like reading the actual Arabic numerals on license plates in Syria before getting close enough to check my work with the smaller "Arabic-style" numerals used with European languages. Repetition is the mother of learning. But mix up the order. For ones I was having trouble remembering, or that I remembered but mixed up, I would spell out a word. Confusing hi ヒ and to ト? Spell out hi-ta-chi and to-kyo, ヒタチ and トキヨ. Or hi-ro-hi-to, ヒロヒト. Remember that the name of early 1990s White House Chief of Staff John Sununu looks like a corporate logo: スヌヌ. Speaking of the mysterious continent of Mu, isn't mu or ム mysterious? Well, as the only triangular one it's certainly different from the rest. "Meh, I can't be bothered with details and penmanship", so me is pretty much just an "X" or メ. Use whatever helps, even if it's goofy or wrong. "Noh is an austere Japanese art form, theatre stripped down to its basics." That probably isn't a good description of Noh theatre, but it helps me remember that the minimalist sign ノ is no. Eventually I managed to draw the entire grid from memory! But then I immediately tried to repeat that, and failed to remember two signs. It took a few more full grids before I (usually) got them all. This was ten days into the trip. Once I was pretty reliably drawing the katakana grid, I immediately started on Hiragana. I would draw the katakana grid with wider columns, the katakana toward the left of the columns. Then I would add in the hiragana, as much as possible by memory and then using my master copy as needed. Oof. This looked like it was going to take far longer. There was very little good news. He is the only sign that was the same, ヘ and へ. Ka is very similar, カ versus か. Mo is similar, モ and も, just getting more cursive. Ya is less similar, ヤ versus や. Otherwise, I saw no similarities. Some hiragana seemed to be in the wrong place. I went back to Wikipedia and the Unicode chart several times before I was convinced that hiragana se really resembles katakana sa (せ サ) and not se, and hiragana fu really resembles katakana ho (ふ ホ) and not fu. Mu is similarly mysterious in hiragana, or at least unique: む vs ム. Te or て resembles the English equivalent, while yu or ゆ has a much sketchier resemblance to the Cyrillic equivalent Ю. John Sununu is now a series of curlicues, すぬぬ. It actually took me less time to memorize the hiragana entries in the grid, just another three days. Some of this probably came from being more accustomed to the consonant ordering of the rows, but most of the improvement came from having figuring out which tricks worked for me. Figure out your own study tricks. This page describes what worked for me, but we're all different. Whatever you're trying to learn, try different approaches and see which ones work for you.